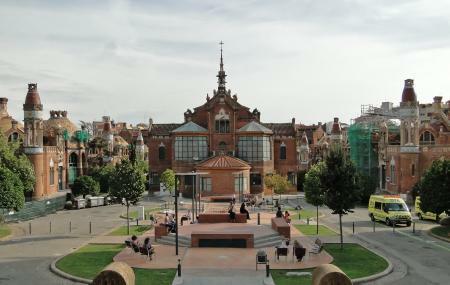 Dating between years 1905 to 1930, this complex was designed by Lluís Domènech i Montaner to be used as a public hospital. Although built for a different purpose than what it is famed for today, the architecture of the building is marvellous and worth spending a glance. Considered to be a landmark in the art-nouveau style, this UNESCO World Heritage Site is an epitome of historic and artistic elegance. Stunning pavilions, landscaped gardens, magnetic underground passages and beautiful interiors are worth your time! Guided visits are available in Catalan, Spanish, English and French, prior reservation is recommended. Group visit, school visits and technical visits have discounted entry fee, check official website for the same. Free entrance: 12th February, 23rd April, 9th May, 24th September, first Sunday of the month (only self-guided visits in the regular route of the visits program). Schedule for guided visit is available on official website. How popular is Recinte Modernista De Sant Pau? People normally club together Sagrada Familia and Casa Batlló while planning their visit to Recinte Modernista De Sant Pau. Don't look at any pictures of the inside before visiting. I have never heard of this place before I visited. I had no idea what to expect. But once I got inside I saw some of the most beautiful buildings my eyes have ever seen. I could've stayed there for hours just sitting down taking it all in. There were hardly any people as well because it is so unknown compared the famous cathedral. It's also a fairly cheap entrance fee and was definitely worth the price. Incredible modernist architecture, one of my favorites in Barcelona. Every single hall or building is wonderfully restored (or in the process of). Free entrance on the first Sunday of every month! Don’t forget to go up the second floor of the main building. I ended up here totally by accident but I will never ever regret. This is one of the most wonderful buildings I have ever seen. The expo is also very well done, it's worth every cent of the entrance fee. I will be back! Beautiful art all around this old hospital. Wonderful small buildings , incredible to think they were once home for so many patients. It deserves a visit. Tourist groups low. Beautiful hospital. It's so difficult to imagine this as a former hospital compared to today's hospitals. I got the audio tour and it was worth it. It wasn't too long like La Sagrada Familia's tour. It was just right to hit the highlights. The audio tour numbers don't match with the map numbers, so be aware. I recommend this place on a beautiful sunny and cool day to enjoy the plaza in the center.